Amenities: Two twin beds that convert to Royal King, picture window or porthole window, private bathroom with shower, mini-safe, vanity area, hairdryer, telephone, and closed-circuit TV. Please Note: Category 2N staterooms 3018-3038, 3518-3538, 4002-4026, and 4502-4526 have porthole windows. Wheelchair Accessible Amenities: Two twin beds that can convert into a Royal King bed with open bed frames, (some rooms have pull down beds and/or sofa beds to accommodate more guests), wider entry door, turning spaces, window, sitting area with lowered vanity, lowered closet rods and lowered safe, private bathroom with wider door, roll-in shower (do not have bathtubs), grab bars, fold down shower bench, hand-held shower head, raised toilet and a lowered sink. 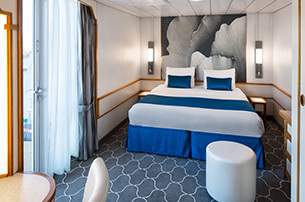 Staterooms also feature closed-circuit TV with close caption, amplified telephone, and a hairdryer. Refrigerator is request only. Interior Two twin beds that convert to Royal King and private bathroom. 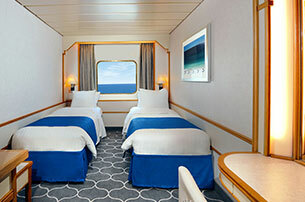 Select staterooms have two pullman beds. 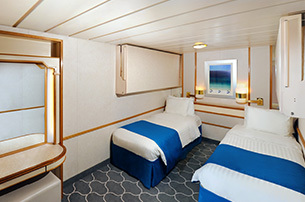 Stateroom: 117 sq. ft. 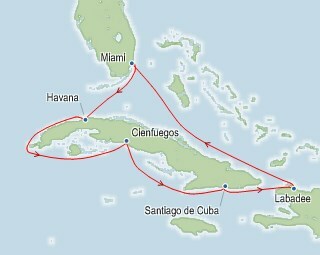 Port Charges, Taxes & Fees $404.00 per person.